I hope all the Gentle Readers of the DMR Blog are enjoying this fine Merritt Day so far. Abraham "A." Merritt was born one hundred and thirty-five years ago today and we're celebrating his nativity in high style. Today, I'm looking to crowdsource answers to some Merritt-related enigmas, one of which has plagued me for well over a decade. 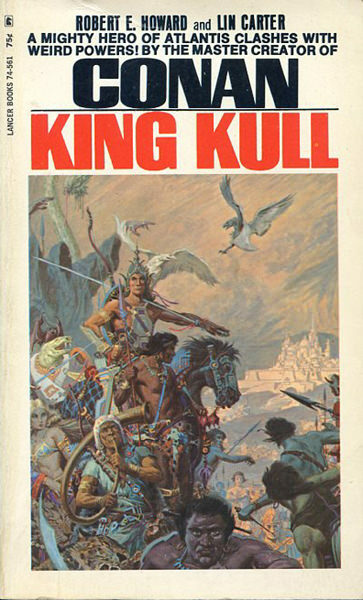 The first question I have is, "Where did the Merritt quote in the third printing of King Kull come from?" If you clicked on the hyperlink above--and who wouldn't?--then you'll see that the third printing was published by Lancer in 1969. That is the copy I have. The cover is by the legendary Roy G. Krenkel and sports a striking portrait of ST Joshi in the foreground. Within the covers, on the blurb page, is this quote: " 'Beautifully told.' -- A. Merritt"
Now, this was back in the 1960s, when "A. Merritt" was still a name to conjure with in the ranks of fantasy fandom. It's perfectly understandable that Lancer Books would invoke his praise of Robert E. Howard--and Kull?--to sell the book. Who found the quote in the first place and where did they find it? My guess is that it was Lin Carter and not the general editor of the Lancer SFF line who found the quote. Lin, whatever faults he might've had, was a true scholar of weird fiction and a big Merritt fan. I certainly don't think he just made up the quote. I've put the question to several modern pulp scholars and none of them know the source. My supposition is that Lin pulled the quote from one of Merritt's letters to Weird Tales, of which there are two. One from 1929 and another in 1935. My money is on the October 1929 letter, which would be just two months after the publication of "The Shadow Kingdom." The problem is that I don't have access to an actual copy of that issue. Or, Merritt might have written that quote somewhere else. I hope someone will help me out. The second conundrum that has troubled me for a few years is, "Who drew up the art for the dustjacket used on the 1947 edition of The Black Wheel?" As the hyperlinked page states, the dustjacket was "added later by a SF specialist dealer to his copies." Hannes Bok--who also completed the Merritt fragment which became The Black Wheel--rendered all of the interior illos for the book, but there is no evidence at all that he did the artwork for the dustjacket. The cover art is certainly done in a style quite unlike Bok's. In my opinion, the dustjacket art is somewhat spare, but well-rendered, with good composition and evidence that the artist read the book in question. In other words, it looks like it was done by a pro. But who? I initially thought it might be Will Eisner because the style is somewhat similar to his. However, it didn't feel quite right. Also, Will never did any SFF book cover art during that period or at any point after. 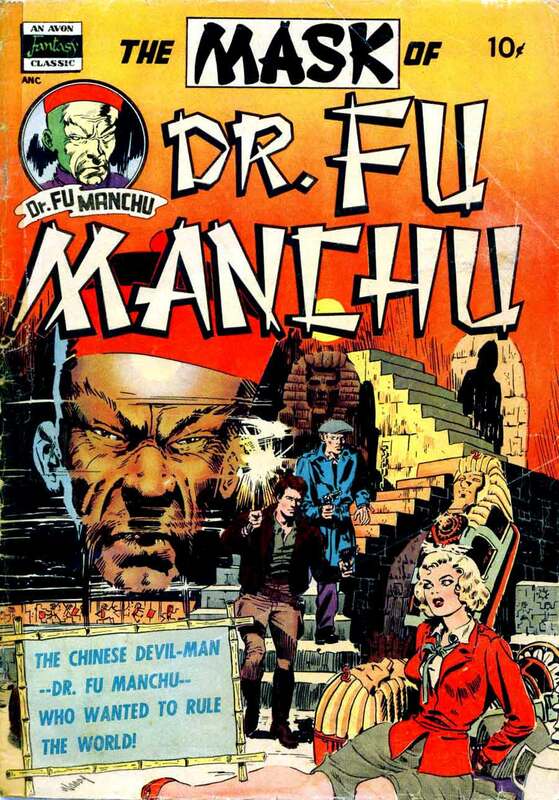 Then, a few months ago, I stumbled upon a certain Fu Manchu comic cover by Wally Wood from 1951. The style of art, especially that of the female figure, is quite close to that of the dustjacket for The Black Wheel. Unfortunately, a detailed bio of Wood states that he was attending art school in Minneapolis during the period when the art for the book cover had to be done. I'd say it's possible that the identity of the dustjacket artist may never be known. That's too bad. The final mystery isn't really a "mystery," as such. I was alerted to a cool "lost" photo of Merritt by a blog post discussing Abe's interest in the Fortean scene--an interest shared by Lovecraft as well. The post was good enough for what it was, but what really grabbed me was the link posted to a 1936 article in Life magazine. That article features a photo of Merritt that I've never seen elsewhere and I think I've seen about all of the readily available pics of Merritt out there. If any of our Gentle Readers have access to that issue, feel free to click the "Contact" button right below the blog header and send a good scan of the photo to Dave. We'll make sure you get credit for it.